How do I find out if the Library has a specific journal? - Ask Us! Q. How do I find out if the Library has a specific journal? Journals A-Z is the best source to locate a specific title. You'll find it on the Library home page next to the JEWL Search box. On the next screen, type the title in the box next to Title begins with. More than one journal may display if your journal title has common words. Identify the correct one. Occasionally, figuring out which title is the one you want may be difficult. Often there are multiple publications with the same title or the title has changed over time. A Reference librarian can help if this occurs. Under the journal title, you'll see various ways we offer access to the journal. Available databases list years of coverage and name. (See screen shot above). 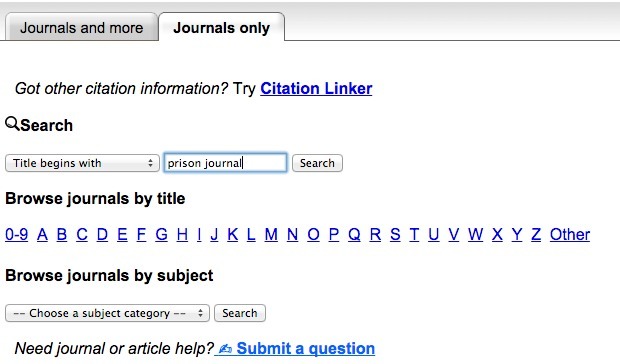 Click on the title of the database to access the journal. If no article databases are listed, the Library does not have a subscription for the electronic database. However, we may have it available in print. Look for Journals in Print at MTSU to see what years we hold. If we don't own the year you need in any format, students, faculty, and staff of MTSU can use the Interlibrary Loan service to have the article delivered for free. Just follow the instructions and let us know if you need help.